Did you know that Beatle George Harrison played the Ukulele proficiently? He is among the most famous of ukulele players. Others include Tessie O’Shea, Cliff Edwards, Bill ‘Uke” Scott, Roy Smeck, and George Fornby. The Ukulele is often associated with Hawaii as it is often used to play that type of music. A ukulele looks like a small guitar and comes in many different styles. There is he tenor ukulele, the pono ukulele, the baratone ukulele, banjo ukulele and a baritone and soprano ukulele. Although the sound is similar to that of Hawaiian music, it is believed that the ukulele dates back hundreds of years and has roots in Portugal. The Ukulele was first brought to the United States in 1915. Famous ukulele players began using this instrument to play early forms of folk music. It has always been the favorite of folk musicians. In the United States, it really picked up with Vaudeville acts which featured Roy Smeck and Cliff Edwards. It was also very instrumental, no pun intended, in the jazz age. Legendary ex-Beatle George Harrison had a great fondness for the ukulele and his last album, that was published after his death, featured him playing the banjo ukulele. Many of the songs on this album featured the Banjo Uke, which make many ukulele fans very happy. George Formby was another famous ukulele player who played the banjo ukulele. He was the son of a famous musician who took over the act after his father died in 1925. When he incorporated the ukulele into his act, he became a raging success and entertained in the United Kingdom through WWII. He was awarded and OBE in 1946 and continued performing with the ukulele until his death in 1961. Tessie O’Shea was another famous ukulele player who also preferred the ukulele-banjo. Originally from England, she moved to the United States where she performed in films as well as on stage. She starred in musicals as well as a variety of television shows. She was one of the few female famous ukulele players who is considered famous. Tessie O’Shea lived in Florida until her death in 1995. Throughout the years, in Vaudeville, comedy, country music and even modern music, the ukulele has been prominent. It has a distinct sound and is picked usually with the thumb or a felt pick. Learning how to play the ukulele is no more difficult than learning how to play the guitar and most of the famous ukulele players were also like Harrison, excellent guitar players. Although the banjo ukulele is among the most famous, other forms of this instrument each have a distinct sound and are used throughout the world to perform a variety of different types of music. In addition to honoring the famous musicians who were ukulele players, like George Harrison, there are also clubs devoted to this magical instrument that has been around for quite some time and has managed to bring a quality sound to many different types of music. This entry was posted in Uncategorized on 08.03.2015 by admin. As we all know the ukulele is played with two hands, the one on the frets and the one for strumming. Where to hold your fingers on the frets is explained in our Chords guide, but let’s talk about strumming. Strumming is basically hitting the strings while making an up-or downward movement. Different patters (strumming patterns) can be played like down-down-up, up-down-down, up-down-up-down, the possibilities are endless and will give a different feeling to the song you are playing. When strumming, try to make the up & down movements with your wrist and not the arm, this will be much less exhausting. It’s also a good idea to hit the strings with the nail and not the fingertip, as this may hurt your fingers. Last but not least: When practicing a lot it may happen that your hands/fingers get sore of both fretting and strumming hand, this happens to everyone, just take a break and continue later on. Now here’s a video that will help you to pick a strumming pattern by Ukulele Mike. Also watch his other videos as they are full of great tips. This entry was posted in Uncategorized on 23.02.2015 by admin. “1, 2, 3, 4” (sometimes subtitled “I Love You”) is a popular single from the Plain White T’s, released in the end of 2008. The song was used in episode 16 of 90210 ‘s first season and a promo for February movies on Hub Network. The song can be played on the ukulele using the following 6 chords: D, A, Bm, G, Gm & A7 (no idea what this mean? Head over to the Chords page). The song with lyrics can be found at the bottom of this post. This entry was posted in Uncategorized on 20.02.2015 by admin. Ok, so now you got an ukulele and you are starting to get the hang of playing chords (like explained in our playing chords guide) it’s time to play some songs! Some basic songs can be found in our Songs section, but of course you want to play more songs. So let’s talk about ukulele song books, which one should you get? Do you want to learn a new song every day? Great, this book provides 365 songs or 1 song every day for a whole year. The Daily Ukulele features ukulele arrangements with melody, lyrics and ukulele chord grids and are in ukulele-friendly keys that are particularly suited for groups of one to one hundred to play and sing. The great songs in this great book include a whole range of music styles, it contains Christmas carols, famous Hollywood tunes, pop songs, folk songs and all time classics from Bob Dylan, the Beatles and many more. Besides the songs, the book also contains sections for tips & techniques, a ukulele chord chart and vintage ukulele-themed photos and art throughout. This number 1 bestseller is more then just a ukulele song book, it contains helpful informations to teach you the basic chords and strums and how to sing and strum chords at the same time. This book also gives you access to an online course with detailed videos, recordings and charts. It is the full package, making this song book highly recommendable! This ukulele songbook uses well known folk songs like “I’ve Been Working on the Railroad” & “Jingle Bells” to help you master key skills. Let that nostalgia kick in or have some great fun with your kids, this song book contains 20 great Disney classics to play on your favorite instrument and will make you want to sing along. 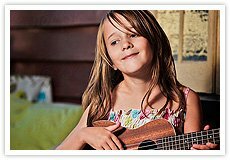 The songs are easy to play and are excellent for the younger ukulele enthusiasts. This book includes the following songs: Beauty and the Beast, Bibbidi-Bobbidi-Boo (The Magic Song), Breaking Free, Can You Feel the Love Tonight, Chim Chim Cher-ee, Heigh-Ho, It’s a Small World, Some Day My Prince Will Come, Supercalifragilisticexpialidocious, We’re All in This Together, When You Wish upon a Star and more. This entry was posted in Uncategorized on 19.02.2015 by admin. 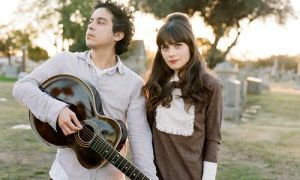 Someone inform Zooey Deschanel on an olde tyme phone: the ukulele has gone mainstream. Yes, the instrument that was once a hipster essential alongside thick-rimmed glasses and craft beer is currently enjoying a massive sales boost. Amazon reports that, between 2013 and 2014, sales of the ukulele have increased by 1,200%. OK, we’ve got our diminutive friend in our hands, we have banished all memory of Tiny Tim tiptoeing through his tulips and we’re trying hard to channel Joaquin Phoenix in Her instead. So where do we begin? Great, but now we’re getting pins and needles in our fingers and we have to admit that our Aretha impression isn’t quite what it used to be. Is there anything we can try that makes us look more like, say, “Ryan Gosling in Blue Valentine”? Still, the ukulele had a formative part to play in rock’n’roll: the best Davids (Bowie and Byrne) started on it, Joni Mitchell had one and even Jimi Hendrix began on a humble one-stringed one. “All you need is the three basic chords and, once you’ve got those, you can play pretty much every song in the history of rock’n’roll.” Even All About That Bass (A, B minor and E 7th, since you ask). For more ukulele chords and info on how to play the chords, go to our Chords page. For more beginners songs check the Songs page. This entry was posted in Uncategorized on 13.02.2015 by admin. A popular song, that is easy to play for beginners is 2013s “Riptide” by the Australian singer-songwriter Vance Joy. The song tab below shows which chords to play. If you don’t know what this means or how to play chords, go to the “How to play ukulele chords” page. Once you learned how to play Riptide on ukulele you can go learn some other songs, like the ones found on the Easy songs to play on ukulele page. This entry was posted in Ukulele song tabs on 29.01.2015 by admin.